GlobalGolf / Accessories / Coolers / YETI / Rambler Straw Lid 30 oz. 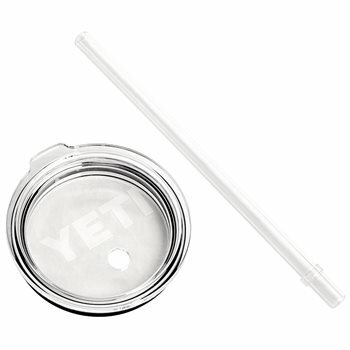 While the Yeti Rambler Tumblers have their renown cold-retaining properties that keep beverages cold for multiple hours, this Straw Lid now makes them easier to enjoy. This wide, durable drinking straw makes this lid perfect for almost any drink, including smoothies and slushies. This lid also features a molded-in stopper that holds your straw safely in place. Additionally, this lid is shatterproof, dishwasher safe, and BPA free. Fits 30 ounce Yeti Rambler Tumblers. What a great add on! It doesn't get any better than a Yeti. Ordered the lid/straw to go with my 30 oz insulated bottle. It works great and doesn't leak.